Real Madrid will be on the lookout for the next permanent manager this summer and one Serie A coach has thrown his name into the hat. 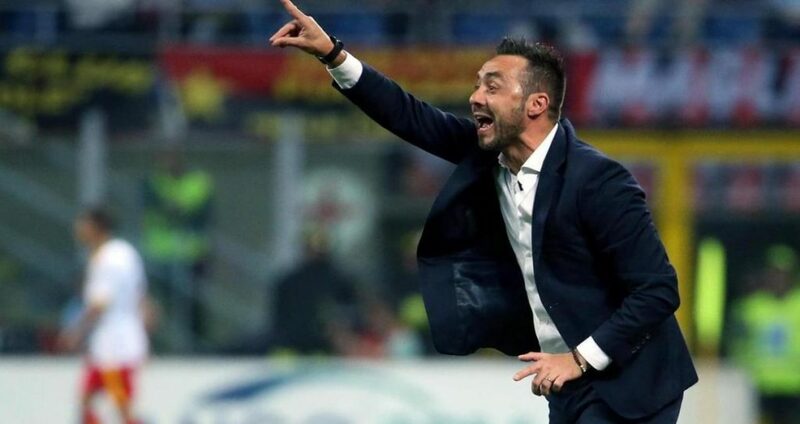 With the Real Madrid job still up for grabs, Sassuolo manager, Roberto De Zerbi has spoken about him being the successor to the throne at the Bernabeu. There are other rumours linking the Italian to the Barcelona job as well. In an interview with La Gazzetta dello Sport, he spoke about a few things including the next step in his managerial career. “I am feeling well here. I’m doing my job in the way I want it. I never have time to rest, football is all that I love and it comes before anything else. I’ve never wanted a good career or money. I also work on the defensive part. On my way. When we played Inter they had no shots on target”. Sassulo‘s head coach Roberto De Zerbi has been thrust under the spotlights once again due to his tactical approach. A former playing journeyman De Zerbi made a name for himself in the coaching circle since he took the job at Foggia in 2014. The Italian favours an adventurous, possession-oriented and offensive style of play, quite similar to the Barcelona philosophy. That said, although counter-pressing is part of De Zerbi’s defending philosophy, Sassuolo isn’t a great side defending, so far. In fact, they allowed a good number of goals and looked vulnerable in transition. However, De Zerbi knows how he wants to play, and he has been able to install his philosophy so quickly at Sassuolo. Time will tell us if De Zerbi will lead a tactical revolution in Italy or if Sassuolo will remain an isolated case in a usually defending Serie A league. Inter and Juve face competition from Madrid, Man Utd for this Serie A star!